In 2015, many of FtL’s school communities were devastated by April and May’s earthquakes in the central development regions of Nepal. Hundreds of children we work with in Suntakhan, Kuashadevi, Mendho, and Shabryubesi lost everything. Project staff and trainees had their homes razed to the ground. Your amazing support has ensured more than 400 families had food throughout the Monsoon and Winter. 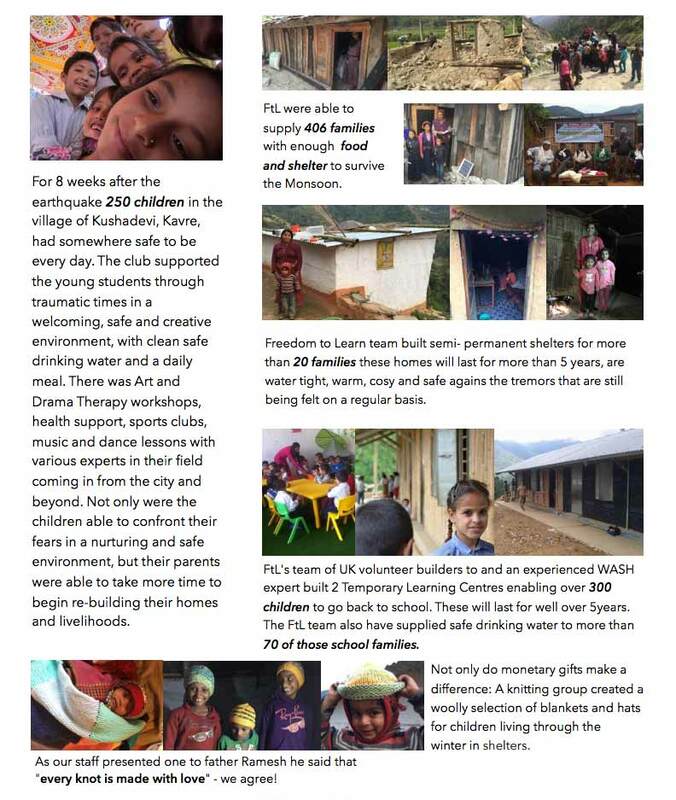 Our team built 3 Learning Centres, have supplied clean and safe drinking water for nearly 600 students, run shelter building workshops with building materials needed, set up and facilitated children’s clubs with counselling and art therapies for just under 300 children. AMAZING backing of our supporters. The real task is ongoing: re-building lives, homes and schools. In the face of such sorrow and devastation there has been a sustained and genuine optimism. There is a wealth of opportunity for re-building local stable micro-economies, creating better quality school environments and earthquake proof, environmentally friendly, economically sound homes and schools for future generations. While the world’s attention wanes, young people in Nepal inspire us with their pragmatic, positive and energetic approach to making their country a better place. Supporting their dedication and recovery will inspire them in turn to make positive change in their lives, their communities and in Nepal society as a whole. Our priority of support is better access to and a better quality of education. You can support us with donations or volunteering – every effort counts!